e.g. Q, QA, QB, QC...QH...etc. 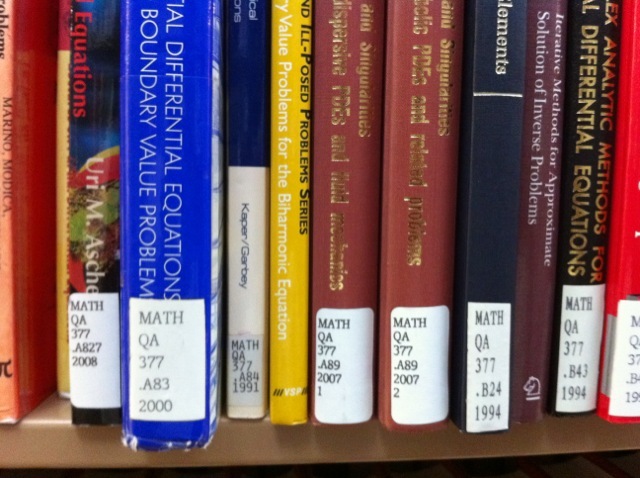 For the call number above, Q identifies the category for Science, and QA identifies the subclass of Mathematics. The letter in the last portion of the call number, .A83, identifies the author, Asmar, followed by a decimal. For journals or edited works the letter identifies the title rather than the author. There may be two series of these numbers, followed by publication year, volume, copy.